He dood it! Who dood it? 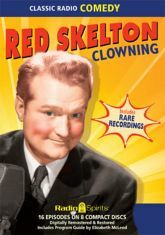 Red Skelton, that's who! Join Red and his alter-egos Clem Kaddidllehopper, Sherrif Deadeye, Willie Lump-Lump, and of course Junior the "Mean Widdle Kid" in this hilarious collection presenting some of Skelton's best work from 1948! Lurene Tuttle, Verna Felton, Pat McGeehan, Rod O'Connor and Anita Ellis are heard in these rare rehearsal recordings and original radio broadcasts, many of which have never before been available.